Hey Creative Scrapbooker Fans! I’m back on the blog today to share with you a fun fantasy themed tag. With Fall in the air, it was fun to work with some bright and cheerful patterned paper which had me longing for some sunny weather to come back. The inspiration for my tag came from the “Always Be Yourself Unless You Can Be A Mermaid” card out of the Simple Stories Collection – Dream Big. To create my tag, I used the Dream Big 12×12 Collection Kit from Simple Stories. As well as the Chipboard Stickers, 4×6 Stickers and the Bits & Pieces from the Dream Big Collection from Simple Stories. For the base of my tag, I used the Medium Etcetera Tag from Stampers Anonymous. You’ll need to choose a piece of patterned paper from the Dream Big Collection from Simple Stories to trace the chipboard tag around. Cut the patterned paper tag out. You’ll also need to choose a second piece of patterned paper from the Dream Big Collection from Simple Stories to trace around the reinforcement tag. Cut the reinforcement tag out. Ink the edges of both pieces using Black Soot Distress Oxide Ink and a blending tool with foam from Ranger Ink. Adhere the patterned paper tag to the chipboard tag using E-Z Runner from Scrapbook Adhesives by 3L. Adhere the cut out patterned paper reinforcement piece to the chipboard reinforcement piece using E-Z Runner from Scrapbook Adhesives by 3L. The focal point for my tag was the “Always Be Yourself Unless You Can Be A Mermaid… Then Always Be A Mermaid” card that came off of the 4”x6” patterned paper from the Dream Big paper collection. To give the card a bit of depth, I adhere it to a second piece of patterned paper and inked the edges of both pieces using Black Soot Distress Oxide Ink and a blending tool with foam from Ranger Ink. Layered in behind the “Always Be Yourself” card are a variety of patterned papers and 4×6 stickers from the Dream Big Collection. All the pieces were inked with Black Soot Distress Oxide Ink and a blending tool with foam from Ranger Ink. Some of the papers were adhered using E-Z Runner and others were adhered using 3D Foam Squares which are both from Scrapbook Adhesives by 3L. For some extra added detail below the card, layer a few borders strips as well as three banners from the 4×6 stickers from the Dream Big Collection. To decorate the bottom right corner of the tag, I layered in fussy cut images from the patterned paper, chipboard elements and bits & pieces from the Dream Big Collection. Ink the edges of all the elements using Black Soot Distress Ink and a blending tool with foam from Ranger Ink. To adhere the elements, I used E-Z Runner and 3D Foam Squares from Scrapbook Adhesives by 3L. To tie the top left-hand corner of the card to the bottom right-hand corner of the card, I used chipboard elements and bits & pieces. Ink the edges of all the elements using Black Soot Distress Oxide Ink and a blending tool with foam from Ranger Ink. To adhere the elements, I used E-Z Runner and 3D Foam Squares from Scrapbook Adhesives by 3L. For the top portion of the tag, I layered the sticker banner and chipboard banner. I adhered the sticker banner using 3D Foam Squares from Scrapbook Adhesives by 3L. To finish off the top of the tag, I created a bow using a piece of white seam binding ribbon. Thanks for taking the time to check out my blog post. I hope that my Always Be Yourself Unless You Can Be A Mermaid Tag has inspired you to make your own at home. Ranger Ink: Black Soot Distress Oxide Ink and Blending Tool with Foam. Scrapbook Adhesives by 3L: 3D Foam Squares, Dodz, and E-Z Runner Pernament Tape. 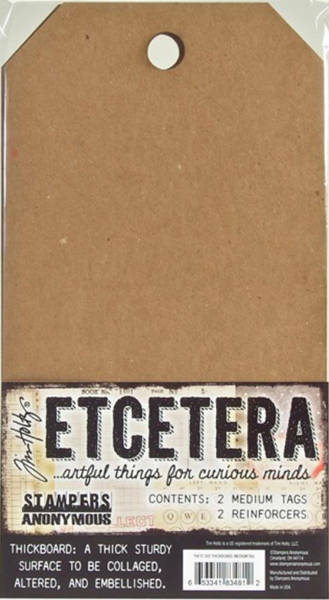 Stampers Anonymous: Etcetera – Medium Tag. Simple Stories: Dream Big – 12×12 Collection Kit, Chipboard Stickers, 4×6 Stickers, and Bits & Pieces. Misc: White Seam Binding Ribbon.